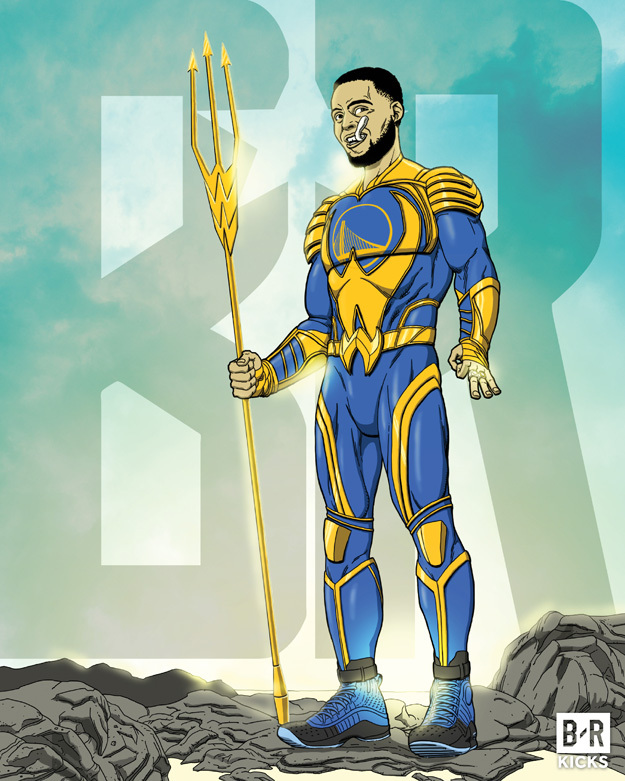 Here’s my illustration of the Aquaman / Steph Curry mashup. It was inspired by the Aquaman Justice League movie poster. I affectionately referred to this piece as “Aqua Curry”. He’s wearing the Under Armour Curry 4 “More Fun” colorway. The outfit’s color scheme is based on the Warriors’ blue and gold colors. There’s the Warriors bridge logo on his chest, enveloped by a giant W over his torso. The belt buckle is shaped in a W.
The trident has been shaped into repeating Ws. He has his signature mouthpiece coming out of his mouth. His left hand is shaped into the signature “3-pointer made” gesture. His two championship rings are on his left hand. He’s wearing his ankle braces that he wears in games.